being little • bristol uk fashion & lifestyle blog. : good morning. I'm not very good at consistantly having breakfast, so to help myself out, I made some granola! It's really easy peasy, and so yum! And you can have it with whatever fruits, seeds and/or nuts you fancy! • Preheat oven to 150ºc. • Mix the oats and seeds/nuts in a bowl. • Put the oil in a cup or small bowl, mix in the vanilla and honey. • Add this to the dry ingredients, and mix well. • Spread over a non stick baking tray and bake for 15 minutes. • Mix in the dried fruit and return to oven for 10 minutes. • Leave to cool before putting in a storage jar. Perfect with yoghurt and fresh fruit! I particularly like it with grated apple. Happy breakfasting! This sounds yummy and the pictures are cute! That looks ridiculously yum! I'd never skip breakfast again if this stuff was around. This sounds delicious, I nearly always pass up breakfast when I'm not at home so will try this in the future! I love granola, this looks amazing!! ooh might try this for a nice summer breakfast. i really need to try this, it sounds lovely! you're pretty skilled in making healthy food actually sound nice ha. This sounds great! 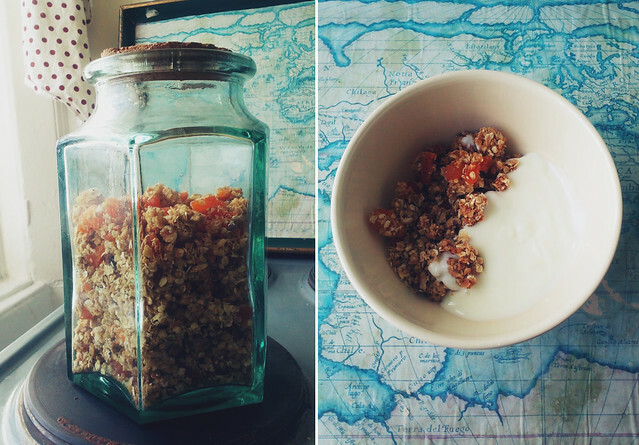 I love granola, but I've never thought about making it myself before. Think I might have to try this at some point. Also, I love the jar that you use to store it!